In the morning when I went out on deck, we were proceeding up Vineyard Sound with the lifeboats swung out. I recalled reading that the Lusitania had done this on her final voyage. But since there had been no reports of enemy submarine activity in the area, my assumption was that this was done so that we could begin tendering as soon as we arrived at the anchorage. When we did anchor, it seemed like we were much further away from shore than I had experienced before. 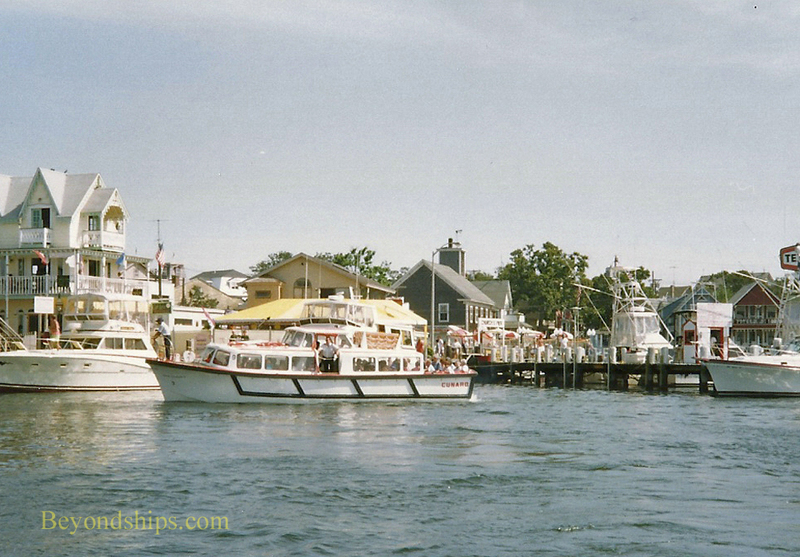 In addition to the distance from the shore, a choppy swell and the presence of numerous pleasure boats who were seemingly unaware of the rules of the road made it a long ride on the tenders. Perhaps because of this, passengers were late returning and the ship did not leave at the scheduled time. Meanwhile, inasmuch as it was the last night of the voyage, there was a party in the Officers' Wardroom that evening. The Wardroom on QE2 was located across the front of the superstructure on Boat Deck. Consequently, it had a nice view over the ship's bow. However, what made it a particularly interesting room was the contents.. These included plaques given to the ship by various ports and organizations, artifacts from old ocean liners and photos of famous places and people. The Wardroom guest book was an autograph collector's dream. Invitations to the Wardroom parties were highly prized. Whereas the guest lists for most of the other parties on QE2 were based upon who had to be invited for marketing or other business reasons, who was invited to the Wardroom parties was based upon who the officers wanted to invite. You only received an invitation if one of the officers put your name on the list. Thus, it was very much a party for the QE2 family, relaxed and full of interesting people. On this occasion, I remember sitting with a group of the younger officers listening to actor George Kennedy and author Tom Clancy give their views on various topics. It crossed my mind that none of the senior officers were present. But since we had only just weighed anchor, I imagined that they were busy on the bridge two decks above. After the Wardroom party, I hurried downstairs to the Mauretania Restaurant. The second seating had begun at 8:30 but as usual, I had stayed slightly past the end of the party. I was seated at the Captain's table that voyage but since it was the last night of the cruise, Captain Woodall was not expected to join us. (Unlike Queen Mary 2, on QE2 the same set of people dined at the Captain's table each night of a voyage. Moreover, either the captain or the staff captain would join the table every night except the first and last night of the voyage). As I recall, it was a pleasant dinner with good conversation about the day's events. 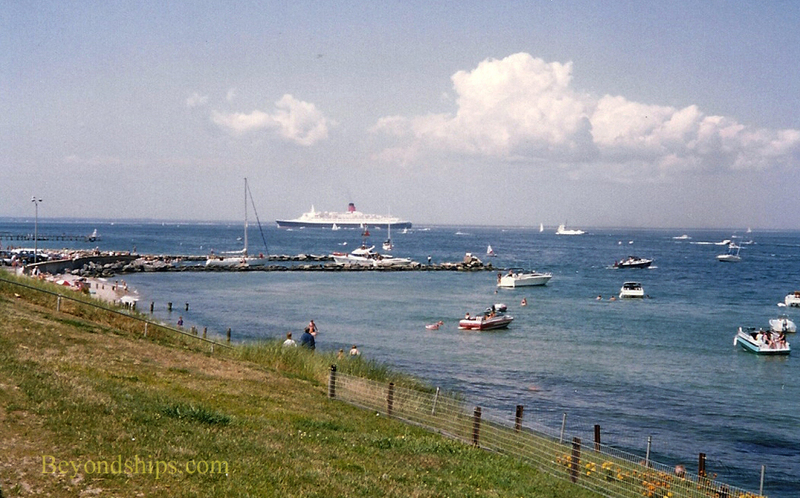 Above: QE2 proceeding up Vineyard Sound with her lifeboats swung out. Below: The ship anchored off Martha's Vineyard. 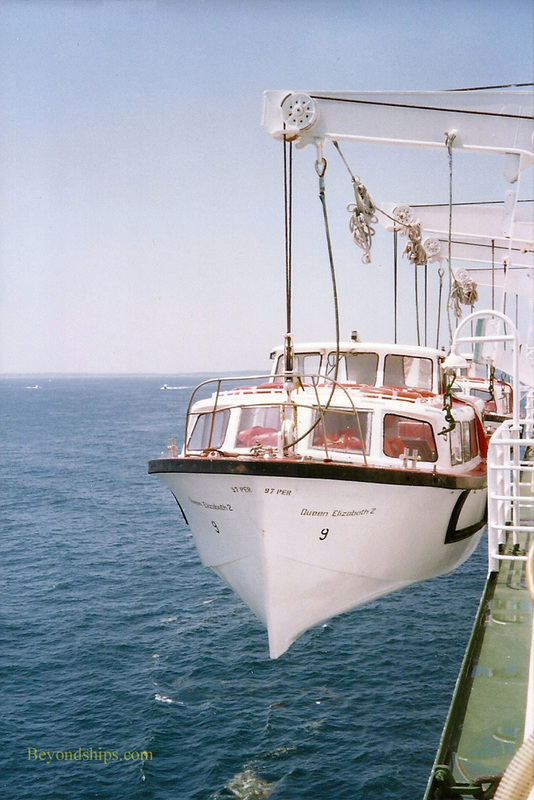 Above: A tender bringing passengers ashore. Below: QE2 a long distance from shore.